Today we bring to review the most chosen wheels for training on road bikes, since they are very resistant aluminum. The Shimano WH-R501 700C has a wear meter. These wheels are practically indestructible! either for training, for the roller or for your second bike. 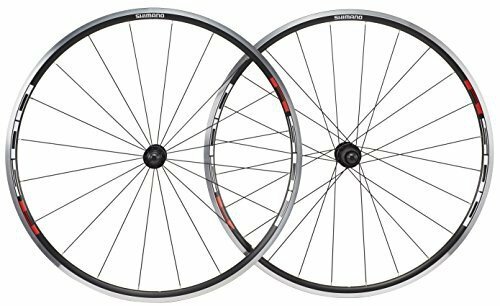 These wheels are essentially the best choice, for example, to ride your training bike essentially for its durability and its price, since they are not excessively expensive, and are more than prepared for battle, always with the usual quality guarantee Shimano. Shimano WH-R501 700C very good wheels! Very good quality in the bushings, a very beautiful radiating, the excellent finish. 100% recommended for act. of 8-10v road bikes. Good wheels and quite light, with quality, they go perfect, without doubts I will repeat again. Perfect, the best quality price, weight and safety. I've been there for years and I do not change them. Of the best without doubt. Perfect wheels to train with, they are super resistant, light and comfortable. It is worth every penny spent on them.